Romanesco is a uniquely fractal looking vegetable that appears to be a futuristic cross between a broccoli and a cauliflower. Its taste is similar in flavor and texture to cauliflower, but it comes in a brilliant green hue. I love all vegetables in a myriad of preparations, but above all else I love my vegetables perfectly and simply roasted with little more than olive oil, salt, and freshly ground pepper. If you are feeling adventurous, you can sprinkle fresh herbs or a ground spice on top of your vegetables. My favorites are rosemary, Garam Masala, or smoked paprika (separately, not all together). Roasted vegetables are made even more perfect when the vegetables are exceptional to begin with. These guys were delicate, small, and gorgeous. I roasted the romanesco with the green garlic, and I saved the cabbage for a potato and leek soup that I made a few days later. The green garlic was subtle, and satisfyingly caramelized and sweet. The Romanesco was tender and mild. This is a great side for any meal, but I ate it drizzled with some lemon tahini sauce as the main part of my lunch that day. This dish is as simple as can be, but I've added a recipe for you anyway. This recipe works with almost any type of vegetable you would like to roast. The key things to do are: use a hot oven, make sure your vegetables are all cut to the same size, evenly coat them with oil, and flip them halfway through the cooking process. Enjoy! Prepare the Romanesco by cutting it into large florets or into evenly-sized slices. 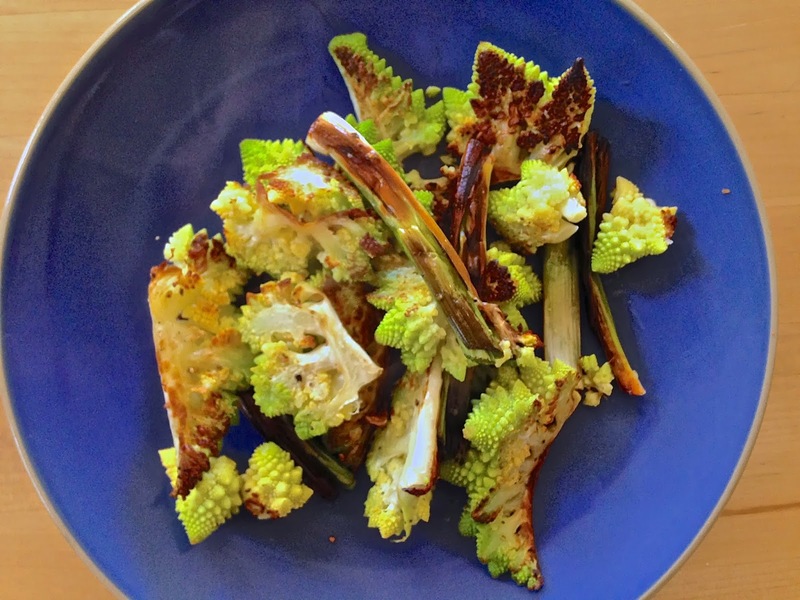 Keep the pieces of Romanesco the same size so that they all cook in the same amount of time. Roughly chop the green garlic. Place the garlic and Romanesco on a sheet pan. Drizzle with olive oil (about 2 tablespoons). Toss lightly with your hands, make sure each piece is evenly coated in oil. If the vegetables do not look slightly shiny with oil, add more until they are fully coated. Sprinkle salt and pepper over the veggies. Roast in the oven for 15-20 minutes, or until the Romanesco is tender and caramelized on the outside. The cooking time will depend on your oven and the vegetable itself. After 10 minutes, check the veg, and once it has started to brown on one side, take the pan out of the oven and flip each piece over. Place the sheet pan back in the oven so that the other side gets browned as well. The second side will brown more quickly than the first. For a boost of flavor, you can squeeze fresh lemon juice over the veg at the last minute.